Bandon Grammar School are fortunate to have Luke Sisk as their Artist in Residence for Creative Engagements this year. Luke Sisk is a full time professional ceramic and glass artist. 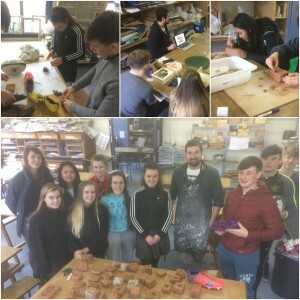 10 lucky transition year students are currently halfway through their glass casting experience. Artist Luke Sisk has envisioned a sculptural light piece that will display surface patterns from around the school and Bandon town. Luke is currently teaching students the mould and casting process of found objects and surface patterns into solid glass pieces. 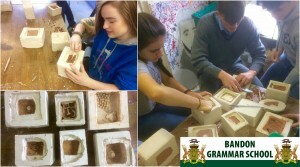 Each student has created numerous clay piece based on textured surfaces around Bandon. 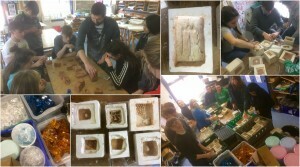 Other students have enjoyed the experience of impressing school objects into clay to create interesting reliefs. The clay pieces have been placed into plaster moulds and casted. For the second workshop students cleaned their moulds and measured the necessary glass to fill their moulds to be fired in a kiln. 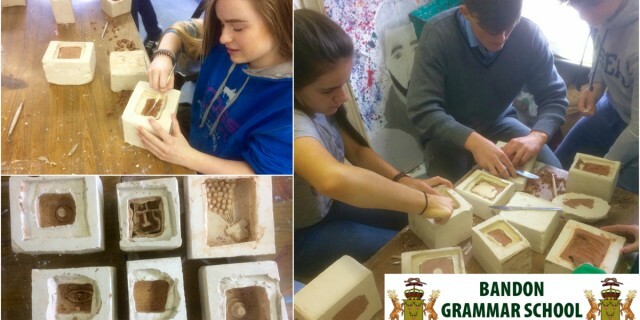 Bandon Grammar Art Department looking forward to the final workshop when students will open up their plaster moulds and see their final sculptural forms and display to the school.